The study that this article was based on was done on mice and used the antioxidant N-acetylcysteine (NAC). The researchers also tested human melanoma cells with a form of vitamin E. In all of their tests, antioxidants caused cancer cells, melanoma cells in this case, to metastasize or spread. When the body is given extra antioxidants, its tumor cells get to keep more of the antioxidants that they already make themselves. The [cancer] cells can store the surplus, improving their ability to survive damage. It’s not so much that antioxidants caused cancer (initiation), but that they promoted the spread of existing, perhaps undiagnosed, cancer (progression). A large trial reported in 1994 that daily megadoses of the antioxidant beta-carotene increased the risk of lung cancer in male smokers by 18 percent. A 1996 trial was stopped early after researchers discovered that high-dose beta-carotene and retinol, another form of vitamin A, increased lung cancer risk by 28 percent in smokers and workers exposed to asbestos. A 2011 trial involving more than 35,500 men over 50 found that large doses of vitamin E increased the risk of prostate cancer by 17 percent. All of this work is about antioxidants from supplements, not from food. Not saying eating lots of antioxidants from food wouldn’t do the same thing, but it wasn’t addressed here. 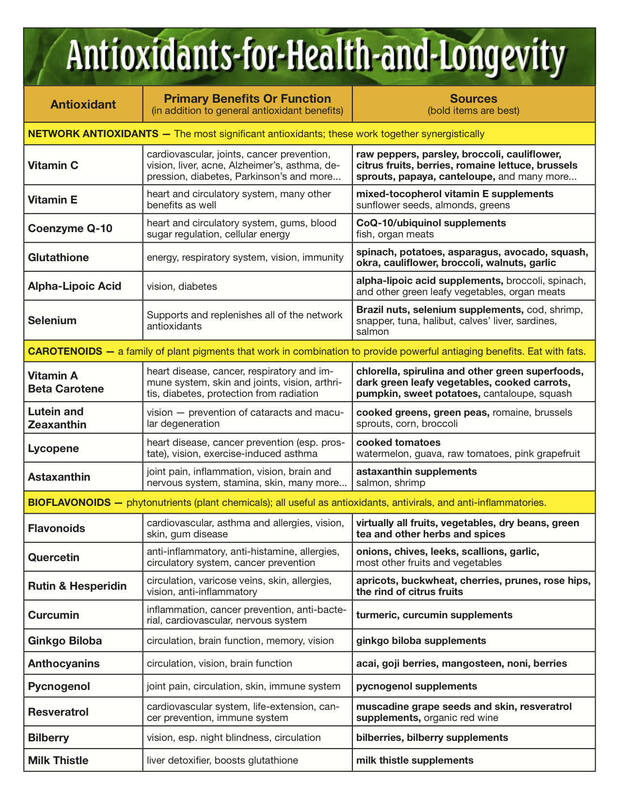 Here’s a list of some antioxidants. Some of these, like vitamin E, selenium, and beta-carotene, have been linked to cancer, in supplement form. This entry was posted in Uncategorized on June 15, 2018 by Bix.